That's one of the coolest things I've seen in a while. Wow, 25 or so signatures. That is way cool! There has got to be some kind of a significant story behind that. If you read the message someone wrote, it's pretty funny. I haven't looked underneath the second door yet but will do that tonight and see. I thought that was very cool that so many people signed them. It makes you wonder if they were there when the last panels went on and saw the "time capsule" be sealed up. I wonder if there is a way of finding out. Maybe by serial number at the factory if there is a record of such a thing from 20 years ago. I would bet that a few of those folks might still be there....and, possibly Andy @HDBRbuilder might know someone? I sent the back panels of my Heresy "flame twins" through the plant to have everybody sign them, prior to them being sealed and lacquered. From the comments by my fellow employees (including Portis Gilley, who had been there since almost the beginning!) and the looks on their faces, I am pretty sure that it was the first time that had ever happened. I do know that every now and then one of the employees would take his "brand new" speakers over to get PWK to sign them, though. I don't know "for sure", but I would guess that these were originally built for an employee, OR the purchaser was on-site and requested this happen...something like: "I want everybody involved in the making of these speakers to sign them". Who knows for sure?? If the labels have a stamp on them which says "not for re-sale" then they were MOST likely originally bought by Klipsch employees. We had to keep any speakers we bought at the employee discount (40% of MSRP back in the day) for a minimum of one-year after purchasing them, before we could re-sell them .After I had the employees sign my Heresy backs, others began to do something like that for speakers they bought, and most of them still have them. 40% off of MSRP was all employees got for purchasing? That's almost the regular sheet cost/margin for speakers these days (before terms discounts) and even back in the mid 80's when I started in the business. Maybe they were different than some of the others. That makes sense about the signing. Thanks for the info, Andy. Not 40% discount...but 40% OF the MSRP...a 60% discount...plus add in the fact that there was almost always one or more "special" things about the speakers, which wouild normally have been an additional cost, but that was waived for the employees. I read that wrong....my bad. Yeah, that's about the same for most of them today so it's good to see that has carried on. Keep in mind that there was a quarterly bonus plan in effect back in those days, so every quarter, depending on the profit for the quarter, the employees got a bonus check based on NON-overtime hours worked and hourly rate or salary for the quarter. Sometimes the quarterly bonus check met or exceeded what the employee had already made in regular checks for that same quarter! So, the first pair of speakers bought were generally around the bonus time, and kept for one year, then often sold to upgrade to another pair of speakers in the line. For instance, buy Heresys first time, the next year sell them for MSRP to somebody, and take that money and buy Cornwalls or LaScalas, then sell them after a year and get K-horns or Belles. Many employees had kids, who got speakers for high school graduation and such, then got an upgrade when finishing college or getting married...or both. It was a "win-win" situation. When I got my basic scuba certification in 1979, I traded a pair of HWO Heresys still in the unopened boxes for all of these brand-new items to my instructor, who also had a dive shop behind his home: Dacor 80 cu ft aluminum tank with valve and rubber tank boot, Dacor Pacer regulator with buddy breathing system, Chronosport SeaQuartz 30 dive watch (the same thing Magnum P.I. wore! ), Dacor rechargeable dive light, Dacor tank pressure guage/depthmeter console, Dacor wrist compass, U.S. Divers buoyancy jacket, and adjustable rubber weight belt with weights included. Pretty good haul for my investment of only about 240 bucks for the Heresys he got! The MSRP on the watch, alone was over 200 bucks! I emailed my buddy in Tulsa that's done Klipsch repair stuff for around 30 years now. He personally knows Ruthie and tried calling her at the plant but she retired a few months ago. He left a message with her sister in law.....both of them worked there for over 30 years. He said hopefully he'd hear back a good story. Well I won some cornwall lll's at the 2006 Pilgrimage in Hope. They were yet to be built and we were told to pick either black, Walnut or Cherry, we picked the Walnut finish because the plant manager said it was the best Walnut they had received in years. We had to go see the girl in the office and let her know, so we did her name was Mrs Donna, we talked a little and before we left I asked her if it were not to much trouble could she get the people in the plant to sign the backs with a permanent marker, just out of respect for doing such good looking work. Mrs Donna kind of freaked out on us saying NO Way we would ever do that to a speaker, it can't happen ! I said OK we didn't want to start any trouble were just thrilled to get the speakers. Well a while later they called to get a shipping address and we told them we would rather drive to pick them up instead of taking a chance on damage during shipping and she said fine whenever your ready just come see me, we told her thank you and left a couple of days later. When we got to the office she said all we had to do was to go over to she shipping building about a mile away and they were waiting for us. 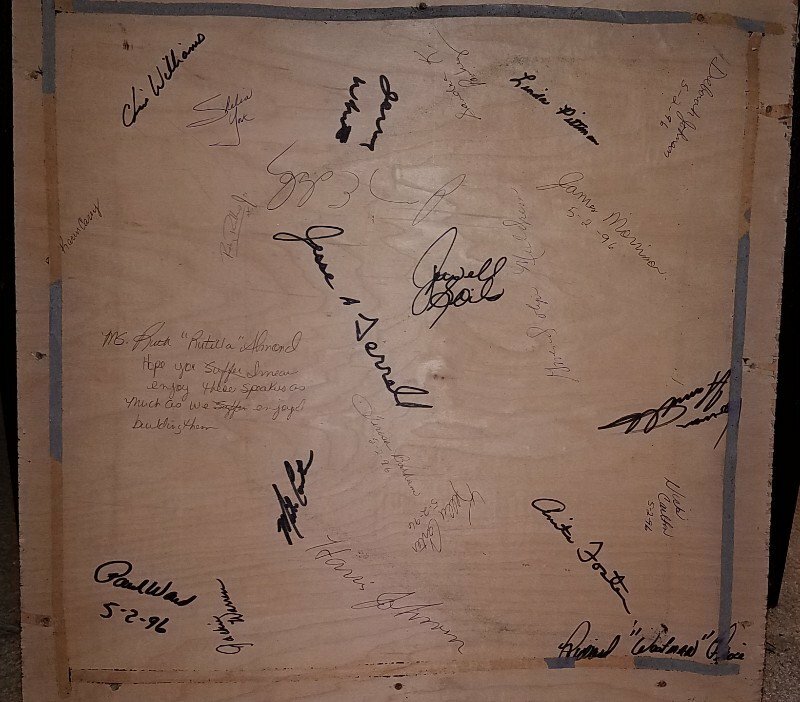 Before we left she said we have something for you and she handed me a brown folder, in it was a certificate for the speakers signed by everyone who worked on them and a cd which had a picture of each employee working on the Cornwalls. This was way more than we had asked for, we thanked her and asked her to please tell everyone working on them Thank You for what they do. We left drove a mile and picked up the speakers and drove home, of all the speakers we have this is one pair we will never get rid of, not that we plan on letting any of them go anywhere. After winning these in 06 it's the reason why if my name is picked at Pilgrimage (and it has) I pass and they pick again, it's only fair and it couldn't beat the shock it was on 06 to win. Try looking at the rear of the speakers, at the top edge of the rear bass bin panel, where the serial numbers were normally stamped into them....and see if there is ALSO a name stamped into them on either side of the serial number. That was what they did for employee purchases IF the employee bought them to KEEP instead of selling them after a year of ownership. 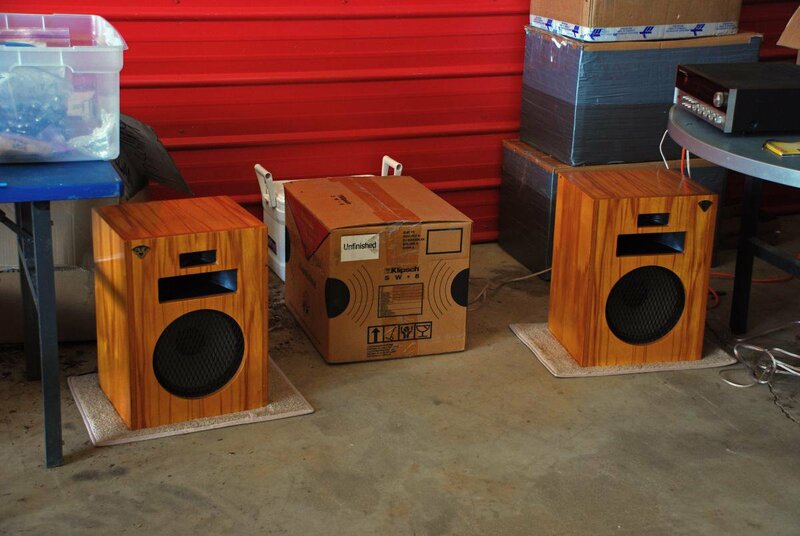 It made much easier to verify ownership, if your speakers were ever stolen and eventually recovered by the police. The name of the employee MAY have been stamped from top to bottom on one of the rear edges of the side panels, instead. Just look for it on the rear of the speaker cabinet. If you find a name stamped in there anywhere, it was the original owner/purchaser. I'll try to take a closer look in that area later today. I don't think any of the pics I have show that area too well. Maybe it's underneath that removable panel that accesses where the crossover and mid/tweeters are at.